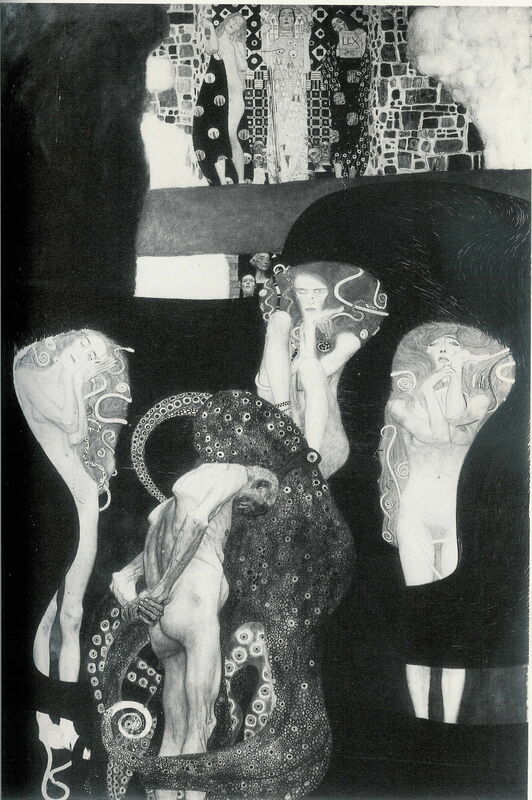 Although in 1903 Klimt had essentially completed his paintings for the Great Hall of the university, and they had been approved by the Ministry then, they remained highly controversial. They were first exhibited in November 1903, but in 1905 Klimt renounced his commission for them, and requested their return. Despite the long arguments and acrimonious correspondence surrounding them, Klimt’s art reached the peak known widely as his Golden Phase, with a succession of major works. Gustav Klimt (1862–1918), Rosebushes under the Trees (c 1905), oil on canvas, 110 x 110 cm, Musée d’Orsay, Paris. Wikimedia Commons. He continued to paint his distinctive landscapes when on summer holiday with the Flöge family at Attersee. Floral motifs such as Rosebushes under the Trees (c 1905) started to predominate, at first with these tiny, almost Divisionist, blobs of colour. 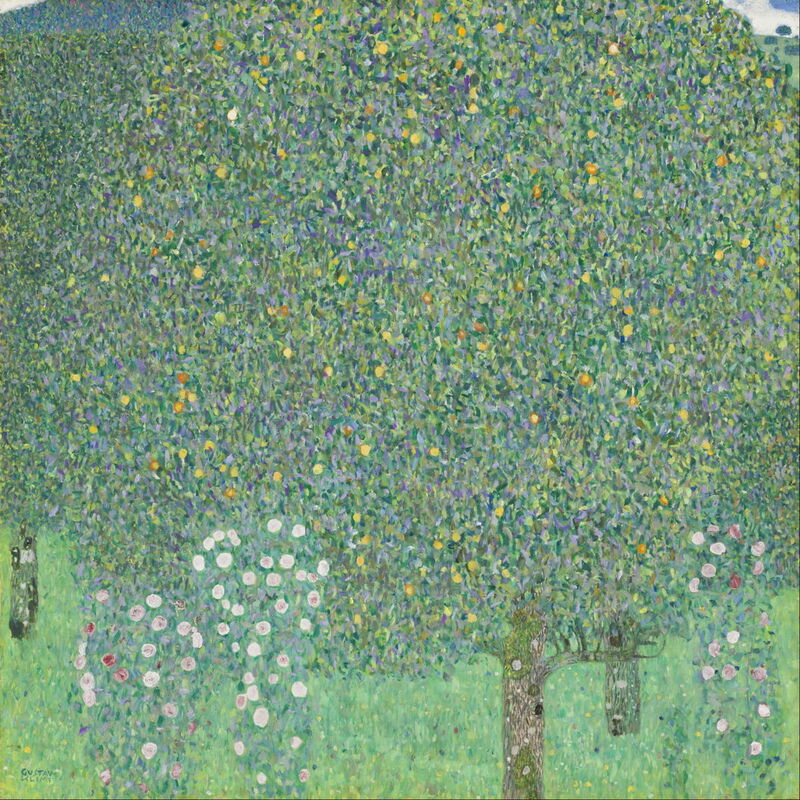 Gustav Klimt (1862–1918), Cottage Garden (1905-07), oil on canvas, 110 x 110 cm, location not known. Wikimedia Commons. 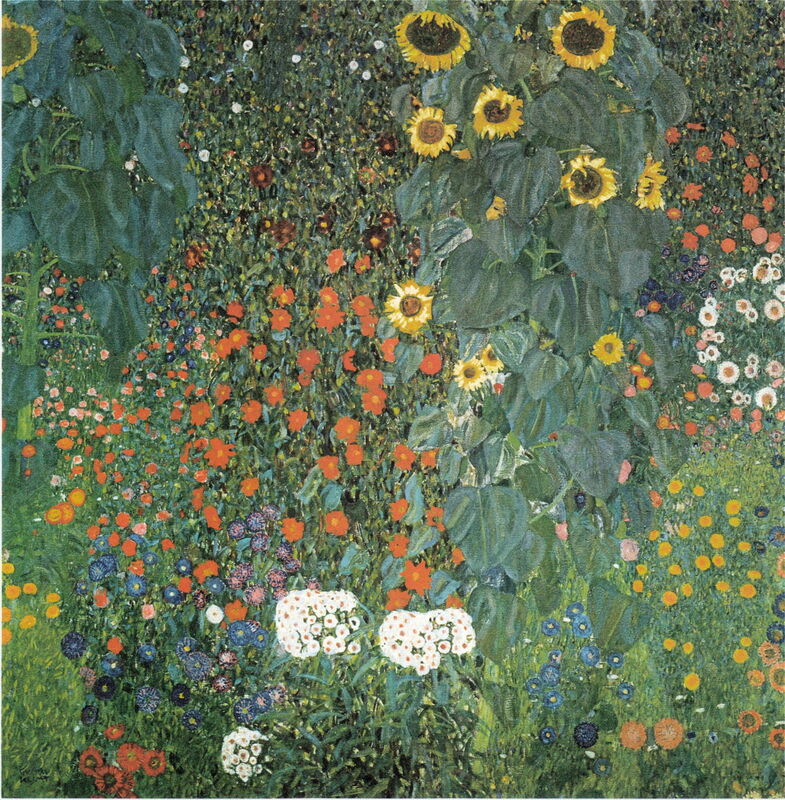 In his Cottage Garden (1905-07), most of his canvas has broken out into bloom, in intense colours and without any sense of depth. Gustav Klimt (1862–1918), The Three Ages of Woman (1905), oil on canvas, 180 × 180 cm, Galleria Nazionale d’Arte Moderna, Rome, Italy. Wikimedia Commons. Klimt’s The Three Ages of Woman (1905) visits a popular theme, in showing a young girl being cradled by her mother, as an older woman stands behind, her face averted from view. Around them is a decorative background which seems to morph between eyes, flowers, and corpuscles suspended in fluid. 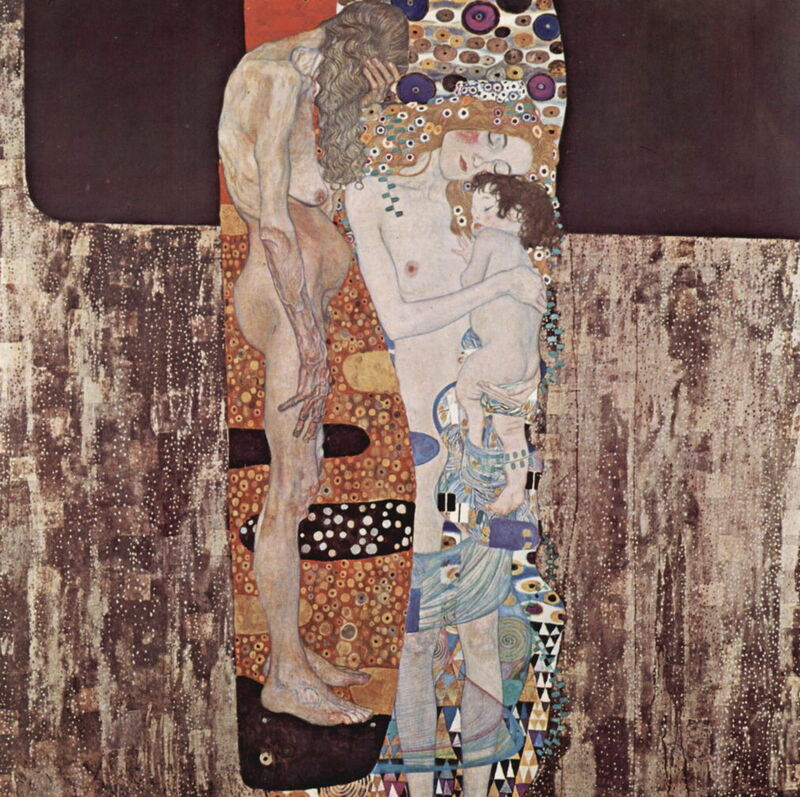 This was one of fifteen of Klimt’s paintings which were exhibited in Berlin that year. Together with Ferdinand Hodler and Ulrich Hübner, he was awarded the Villa-Romana Prize, but ceded it to Max Kurzweil. In 1905, members of the Vienna Secession split over the inclusion of art other than paintings at its exhibitions. 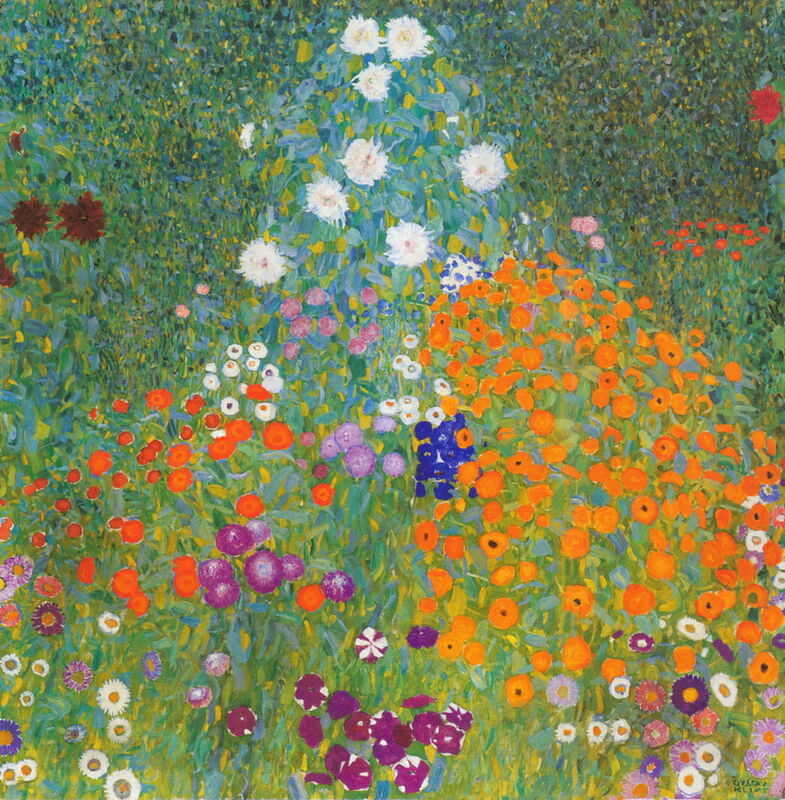 Klimt and several others considered that crafts should also be exhibited, and left the Secession as a result. The following year, Klimt visited Brussels and London, then at the end of the year he went to Florence. His holiday paintings acquired great detail in the textures and forms of leaves, and in Cottage Garden with Sunflowers (c 1907) he included sunflowers, which had become almost symbolic of Impressionist and Post-Impressionist movements. Accepted as being finished by 1907, his huge ceiling panels for the Great Hall of Vienna University were being stored in Schloss Immendorf in 1945 when it was set alight by retreating German forces, and were tragically destroyed as a result. I have only been able to find monochrome images of them, apart from one detail for which a colour photo survives. Gustav Klimt (1862–1918), The Faculty of Medicine (series for the Great Hall) (1907), oil on canvas, 430 x 300 cm, destroyed by fire in 1945. Wikimedia Commons. That for the Faculty of Medicine is rich in figures, rising up from that of Hygeia, daughter of Asclepius (or Aesculapius) and goddess of health, hence hygiene. Dotted over swirling masses of dark hair are white symbols or corpuscles, at the top of which is a full skeleton. 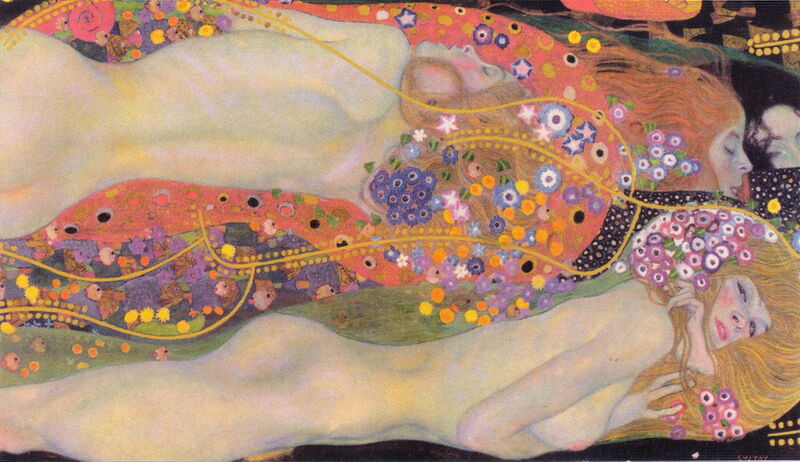 Klimt’s projection would have made this appear even more impressive when it was in position on the ceiling. The figures at the right represent the river of life, and linking that with the woman at the left are two arms. At her feet is an infant. Gustav Klimt (1862–1918), The Faculty of Medicine (detail of Hygeia) (series for the Great Hall) (1907), oil on canvas, 430 x 300 cm, destroyed by fire in 1945. Wikimedia Commons. This colour detail of Hygeia gives a small impression of how wonderful the painting must have appeared, with its rich colours and extensive gold leaf. The serpent is the snake of Asclepius, and the cup which she is holding is that of Lethe, the river of forgetfulness in the underworld. Gustav Klimt (1862–1918), The Faculty of Jurisprudence (series for the Great Hall) (1907), oil on canvas, 430 x 300 cm, destroyed by fire in 1945. Wikimedia Commons. For the Faculty of Jurisprudence, eye-like objects cover the surface of an octopus, which is embracing the bowed figure of a criminal. Surrounding the criminal are three Furies (Erinyes), and in the background the three personifications of truth, justice, and law look on. Gustav Klimt (1862–1918), The Faculty of Philosophy (series for the Great Hall) (1907), oil on canvas, 430 x 300 cm, destroyed by fire in 1945. Wikimedia Commons. 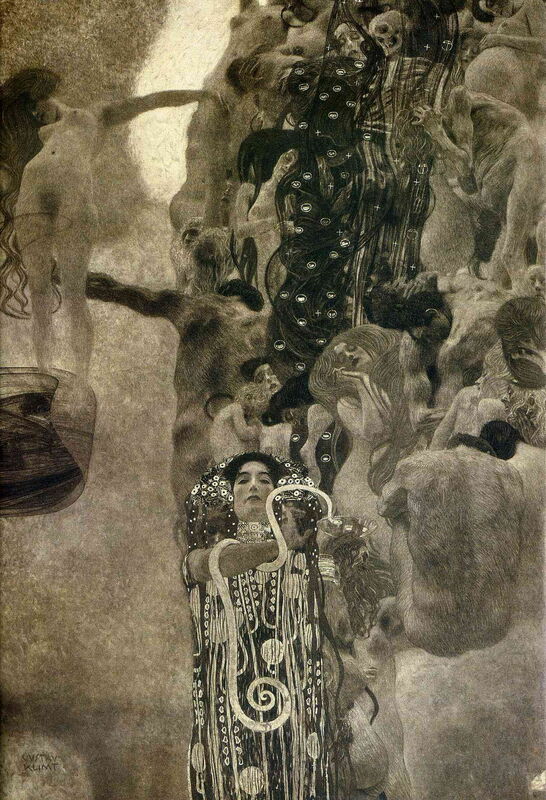 Most challenging of all, Klimt’s painting for the Faculty of Philosophy uses faces and figures to envision thought. He described the group of figures on the left as showing the beginning of life, its fruition, and eventual decay. On the right, the globe signifies mystery, and emerging below is the figure of light, representing knowledge. Another of Klimt’s major works completed in 1907 is Danaë, which tells the story of the princess imprisoned by her father, the King of Argos. Despite her father’s efforts to keep her in complete isolation, she is raped by Jupiter/Zeus, who descends as a shower of gold through the ventilation grille at the top of her cell. 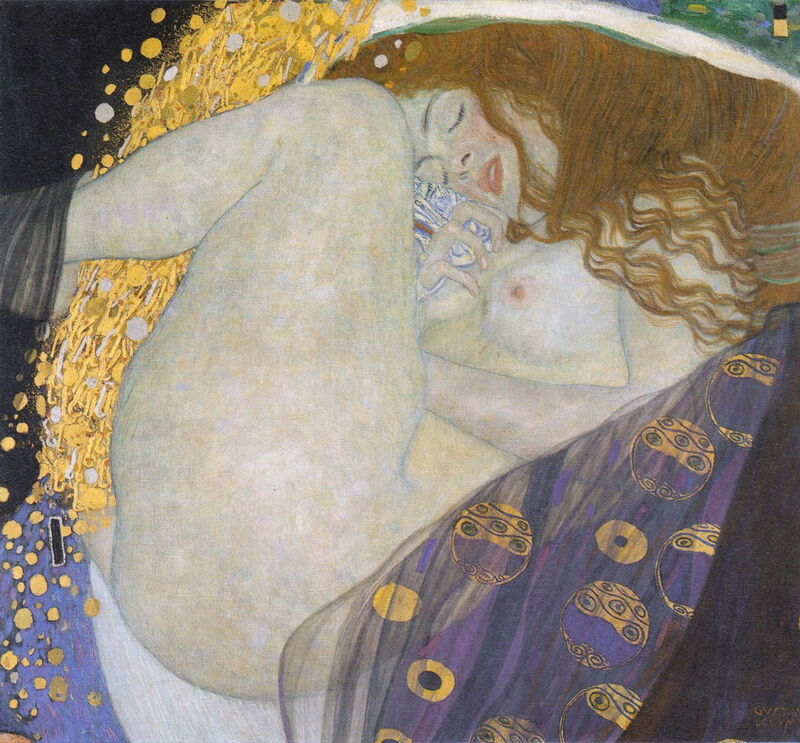 Often misunderstood as being ‘symbolic’ or Symbolist, Klimt’s painting is a literal depiction of the myth which follows artistic tradition, although he expresses the image in a style unique to himself, and in keeping with his Golden Phase. Danaë is shown curled into a foetal ball, and is usually interpreted as showing arousal. She became pregnant, later giving birth to the mythical hero Perseus. Gustav Klimt (1862–1918), Watersnakes II (Girlfriends) (1907), oil on canvas, 80 × 145 cm, Private collection. Wikimedia Commons. 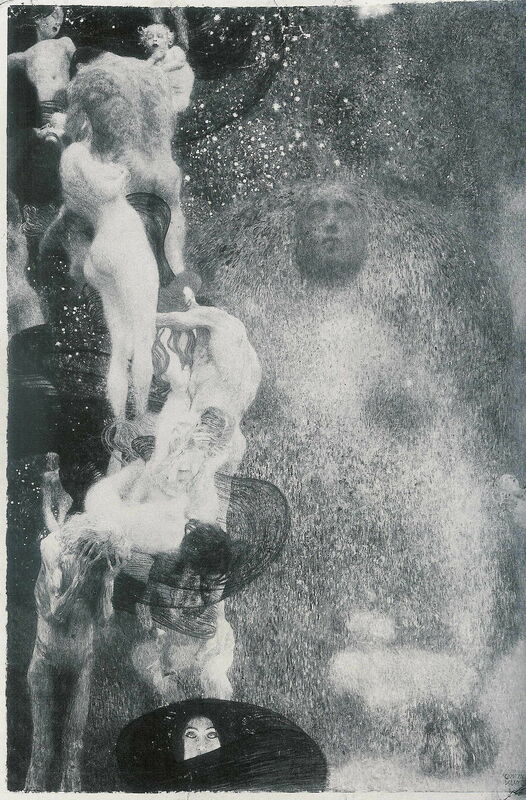 In Watersnakes II (Girlfriends) (1907), Klimt develops the theme of women in a fluid environment, here with their bodies in decorated bubbles, filled with stylised flowers which appear to have spread from his floral paintings. This is sometimes interpreted as showing a physical lesbian relationship, although its two main figures are shown in separate bubbles and very different from his explicit drawings of the time. Klimt continued to paint commissioned portraits, of which by far the most famous – often considered the peak and end of his Golden Phase – is that of Adele Bloch-Bauer. 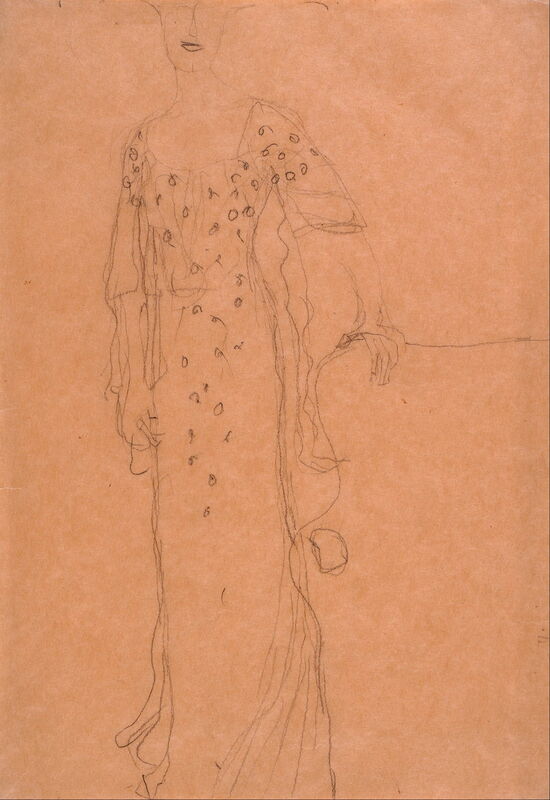 Gustav Klimt (1862–1918), Study for Portrait of Adele Bloch-Bauer I (1903), charcoal on paper, 45.6 x 31.4 cm, The Jewish Museum, New York, NY. Wikimedia Commons. Bloch-Bauer had already been the model for the face, at least, of Klimt’s Judith I (1901), and there has been speculation that she was one of Klimt’s lovers rather than just a friend. She was from a wealthy Jewish Viennese family, and at the age of 18 underwent an arranged marriage to a wealthy banker. In 1903, her husband commissioned Klimt to paint her portrait, and over the following year or so, Klimt made over a hundred drawings in preparation, including this charcoal Study for Portrait of Adele Bloch-Bauer I (1903). At the end of that year, Klimt visited Ravenna, where he saw and was deeply impressed by the Byzantine mosaics of Justinian I and the Empress Theodora in the Basilica of San Vitale. They inspired the portrait which he completed by 1907. 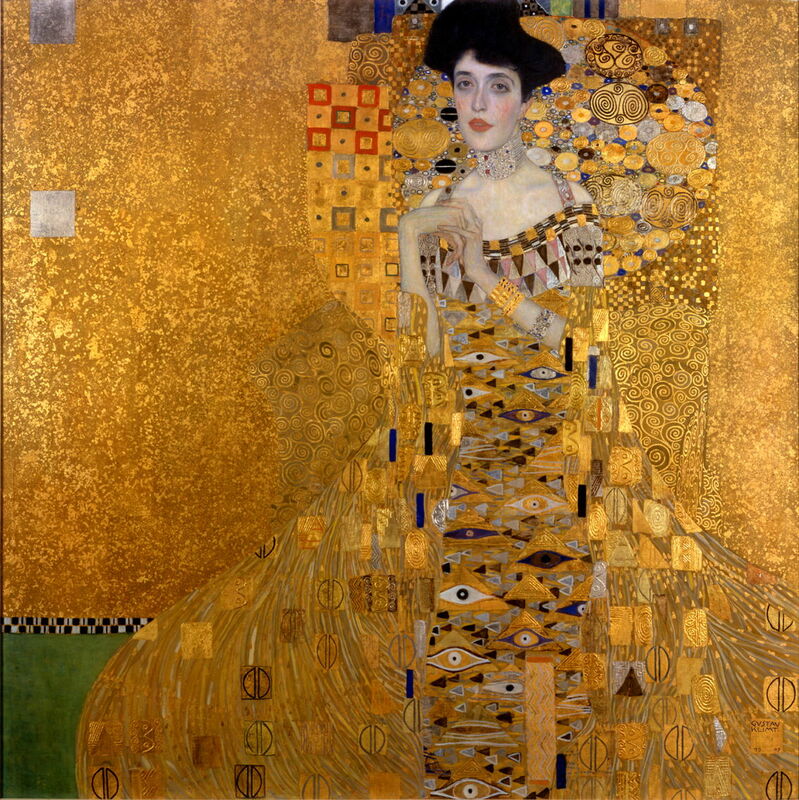 Klimt’s first Portrait of Adele Bloch-Bauer is the most extreme and startling work from his Golden Phase. Apart from her bust and arms, which are painted in oils, the rest of his canvas is, like the mosaic of the Empress Theodora, encrusted with gold and silver. Its decorative patterns include symbols of eyes, flowers, whorls, ellipses divided into halves, and rich textures worked into the gold leaf. 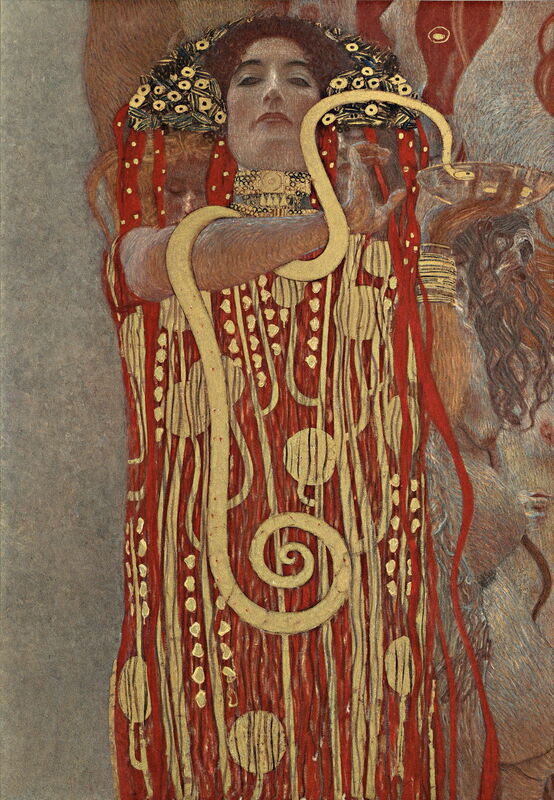 Bloch-Bauer wears a choker around her neck, similar to that shown in Judith I, and studded with jewels, as well as heavy gold bangles on her left arm. Her left hand is closely embracing the right, held high in front of her low-cut neckline. There is no other painting quite like it. In the summer of 1907, Klimt met Egon Schiele, who became greatly influenced by Klimt’s work, particularly his drawings. Stephan Koja (2006) Gustav Klimt, Landscapes, Prestel. ISBN 978 3 7913 3717 3. Rainer Metzger (2005) Gustav Klimt, Drawings & Watercolours, Thames & Hudson. ISBN 978 0 500 23826 4. Various larger format books contain most or all of his figurative paintings. Posted in General, Life, Painting and tagged art nouveau, Klimt, landscape, painting, Schiele, Secession. Bookmark the permalink.